Humans have long dreamed of discovering intelligent life beyond Earth. But truth is, we have no way of knowing if an alien civilization would be friendly or hostile. Should we have the rotten luck of discovering the Borg, we’ll need to get our collective asses into hiding quickly—and a team of astronomers thinks they know how we can. Naturally, it involves lasers. 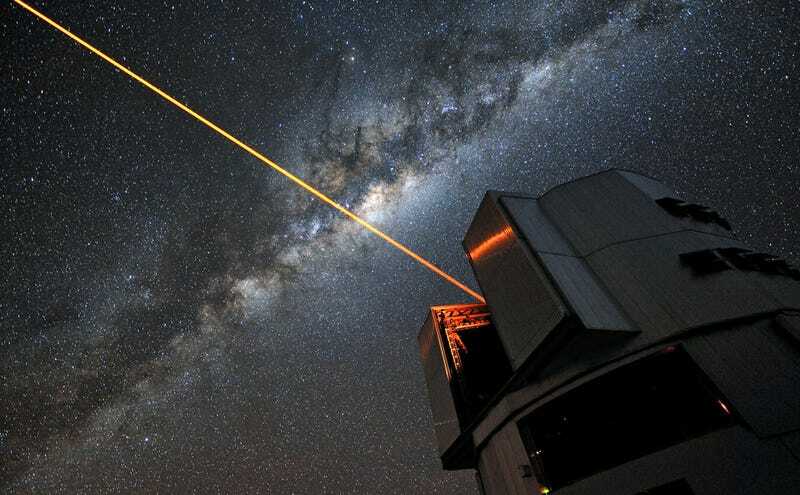 A laser cloaking device is certainly one of the wackier concepts to make its way into the Monthly Notices of the Royal Astronomical Society of late. But in principle, it’s rather straightforward. The idea is, if we wanted to hide ourselves from prying aliens searching for planets to strip mine, we could do so by firing a laser beam at the precise moment Earth crosses in front of the Sun from the perspective of other stars lying along the same plane. By doing so, we’d cancel out Earth’s transit—the same footprint the Kepler space telescope uses to pinpoint planets orbiting other stars. According to Teachey’s math, blasting a 30 megawatt laser for about ten hours, once a year, is enough to eliminate Earth’s transit footprint in optical wavelengths. 30 megawatts is comparable to the energy collected by the International Space Station in a year, and if we’re talking about the survival of human civilization, that’s a goddamn bargain. If we’re really paranoid, we could build a chromatic cloak effective at all wavelengths, but that would require an array of tunable lasers pulling some 250 megawatts of power. Still sounds like a bargain—but we ought to be careful. A really good cloak could backfire. “If you cloaked the entire planet, they might still be able to deduce that something is going on through radial velocity measurements,” Teachey said. Imagine if humans found indirect evidence for a planet, but for some reason, couldn’t see the damn thing at all. We’d probably start paying very close attention. As is always, always, always the case when we’re talking about aliens, caveats and assumptions abound. For one, turning this sort of cloaking device on after we’ve been discovered by hostile aliens might not work out so well—it’s more of a preventative measure. Second, it’s likely that any other intelligent civilizations out there are far more advanced than us. Meaning, they could have extremely sophisticated technology for pinpointing the location of Earth-like planets. They could be laughing at our rudimentary light tricks as they fire up a much bigger laser intended to melt our planet down into a ball of harvestable raw materials. Or maybe they don’t give two shits about us. Or maybe we’re alone. On the other hand, maybe we find signs of another civilization that hasn’t yet left its solar system and doesn’t know we exist, and Stephen Hawking convinces the SETI community to keep things that way. I guess we’re better off having a cloaking device on hand than not, so that we can make a responsible choice if and when we discover our galactic brethren. Because, responsible choices—that’s how humanity rolls, right?